Ciaran O’Reilly, J. Smith-Cameron and John Keating in Juno and the Paycock. 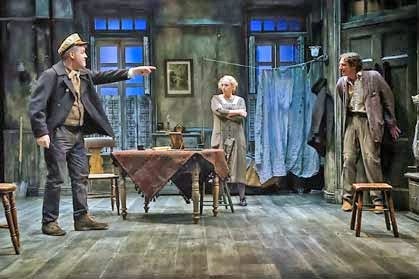 If you’ve never seen Juno and the Paycock, Sean O’Casey’s wonderfully well-written tragicomedy about the individual human cost of the Irish Civil War, the new production at the Irish Repertory Theatre in New York is about as perfect an introduction to the Irish classic as you could ever ask for. The second work in O’Casey’s famous Dublin trilogy (which includes The Shadow of a Gunman and The Plough and the Stars) Juno provides a richly detailed portrait of the Irish nation emerging, if you could truthfully call it that, from the centuries-long nightmare of British colonialism. In Juno and the Paycock O’Casey introduces us to the Boyle family, a typical Dublin working class family of the period, as they scrabble to make a living in a nation that’s turning in on itself though a brutal civil war. Poverty, O’Casey reminds us, is a form of violence in itself, and he never loses sight of the fact despite all the conflicting forces that clamor for a hearing in the play. In Charlotte Moore’s brilliantly paced production at the Irish Rep every type of poverty -- financial, emotional and spiritual -- is contemplated and lucidly staged. First produced at the Abbey in Dublin in 1924, Juno is set two years earlier, when conflict over the Anglo-Irish Treaty divided the Irish Republican Army between those who supported the compromise, and those who rejected it as falling too far short of the goal of national unity. As Juno Boyle, the hard working housewife O’Casey names after the Roman goddess of marriage, actress J. Smith-Cameron convincingly shows us the thankless job her character has to keep a roof over her family’s head as the nation wages war. As the walls close in Smith-Cameron crisscrosses the stage in fury and indignation, at times almost threatening to take flight, in a dazzling performance that deepens most affectingly as it progresses. Juno knows her husband Captain Jack Boyle (Ciaran O’Reilly) is a ne’er-do-well and a dreamer, but she wants to believe he’ll reform himself and be the bread winner she needs him to be, in despite of all. That human capacity for self-deception is everywhere on display in Juno. Captain Jack has convinced himself he was once a well travelled sailor, Juno has convinced herself she can stave off the growing chaos that surrounds her family, her daughter Mary Boyle has convinced herself that her posh suitor Mr. Bentham is the man of her dreams, and son Johnny Boyle has convinced himself he won’t be held to account by the IRA for the death of the comrade he betrayed. As Captain Jack, Irish Rep co-founder O’Reilly mines O’Casey’s tragicomic script for its pathos and humor in a bravura performance that he often delivers at his own expense. O’Reilly’s Captain Jack is an intentional buffoon, a man who knows exactly how much he can get away with and rarely strays beyond. But O’Reilly’s Captain Jack also shows us that he expects his shortcomings to be forgiven because he’s charming, although he’s deeply unforgiving of the shortcomings of others. Ireland’s generational poverty and the violence colonialism has done to her people are conveyed by the play’s grim tenement setting and by the maimed body of Johnny Boyle (Ed Malone), the young man who has lost his arm in a bomb blast. O’Casey has created the social background to the play with a flair for authenticity that gives the play its epic scope (the evocative set design by James Noone is so good it deserves to be considered another character in the play, and the sound design by M. Florian Staab is first rate). But the men in Juno are the least interesting and effective part of the world of the play, curiously enough. They do not struggle like the women do to hold their families together; they refuse to expose themselves to the deep hurts of this world if they don’t have to. That leaves it to the women in the play (and this production) to try to chart a course through the ruination that colonialism and its consequences have made of their city and their homes. Juno may be the god of marriage, but the Paycock she calls her husband threatens to undo everything she has built. O’Casey’s clear-sighted assessment of the social and religious forces that will blight the lives of the emerging Republic is startlingly prescient and he puts them all on stage -- a conservative clericalism that offers more judgment than compassion; intolerant patriarchs that will quickly condemn even their own children; men and women who will sell out their neighbors and friends for a few pieces of silver. All the recognizable horrors of the first decades of the Irish Free State are already assembled as the play begins. Moore has created a brilliant ensemble for her production. As Mrs. Tancred, the dependably brilliant Fiana Toibin gives a pitch perfect rendition of the play’s most memorable speech. John Keating has completely re-imagined the role of Joxer Daly, giving him a level of intuitive street cunning that finally underlines the plays central themes. Ed Malone undercuts O’Casey’s melodramatic moments by investing them with an uncommon subtlety of feeling, and Terry Donnelly shines as the native Dubliner with her eye on the bottom line. Don’t miss this production. It runs until December 8 at the Irish Rep on West 22nd Street. For tickets and showtimes visit www.irishrep.org.